When I was a young girl in my early teens, my family and I would sometimes head out to the high-end shopping district of Bethesda, Maryland. Being so close to the border of upscale Washington D.C. made the stores a wonderland of goodies to browse through. There were enticing restaurants, gorgeous clothing boutiques and lots of fine jewelry store windows to drool over. In the midst of one of these storefronts along the eastern sidewalk of Connecticut Avenue were two recessed displays of magnificent rings, pendants, bracelets and earrings under the banner of Wellington Jewels. I thought I was looking at the biggest, most expensive diamond ring collection I had ever seen. When I found out that the entire collection was simulated, I was floored. They looked so real. Perhaps it was that experience that imprinted a love of all things that looked rich and luxurious, but that normal people could afford. The founder and inventor of the gorgeous Wellington Jewel Collection was an elegant woman by the name of Helen Ver Standig. Her fake diamonds caused a sensation in the jewelry world. She was a tiny woman who left a huge impact on the simulated diamond trade. Everybody has secrets; including wealthy socialites and those from the upper classes. The beautiful thing about being wealthy is that nobody is going to question whether that huge 4-carat stunner on your finger is real or not. Wellington stones were so real-looking, that even the elite found them worthy of wearing. What Happened To The Wellington Diamond Collection? The popularity of QVC Diamonique Jewelry is world-wide. 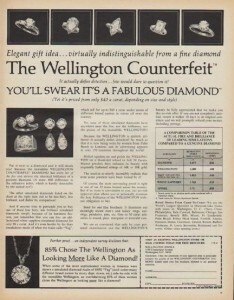 However, few people know that QVC acquired the Wellington Jewels inventory and trade name in the early 1990’s. What does that mean? For me, that means that every time I see a Diamonique stone, I remember Madame Wellington and the brilliant way she made wearing fake diamonds simply fabulous.